Part I: Socio-Political and Ethical Issues in Cross-Cultural Assessment. Introduction. The Challenge of Non-discriminatory Assessment in a Culturally Diverse Society. Ethical and Legal Issues in Cross-Cultural Assessment. Toward a Bio-Cultural Perspective of Assessment. Toward a Bio-Cultural Perspective of Assessment. Part II: Practical Issues in Cross-Cultural Assessment. Assessing the Intellectual Functioning of Children from Culturally Diverse Backgrounds. Assessing the Linguistic Proficiency of Children from Culturally Diverse Backgrounds. Assessing the Academic Performance of Children from Culturally Diverse Backgrounds. Assessing the Visual-Motor and Neuropsychological Functioning of Culturally Diverse Children. Personality Assessment and Culturally Diverse Children. Cultural Issues in Vocational/Guidance Assessment. A Bio-Cultural Approach to Report Writing. Part III: Implications for Cross-Cultural Training, Research, and Policy. Training School and University Personnel to Work with Cross-Cultural Ethnic Minority Populations. Implications for Cross-Cultural Research in Assessment. Policy Implications in Cross-Cultural Assessment. References. Biosketch of Authors. Index. 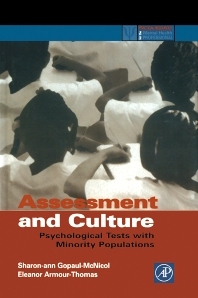 Assessment and Culture challenges the classical approach to the assessment of minority populations by pointing out the deficiencies in this approach and offers instead a bio-cultural model of assessment. The principle objective of this book is to help mental health professionals to more accurately assess individuals from various ethnic, cultural and linguistic backgrounds. The culture-fair techniques and strategies of the book tap into a broad range of the abilities and aptitudes of the examinee. Assessment and Culture provides a cultural frame of reference which allows the examiner to take into account the individual's social and cultural factors in development, coping style and personal history. Individual chapters consider the practical aspects of assessing the intellectual, linguistic, academic, visual-motor, emotional and vocational functioning of culturally diverse children. An entire section of the book is devoted to writing the assessment report. Clinical psychologists, social workers, and educational psychologists. Sharon-Ann Gopaul-McNicol, Ph.D. has recently been appointed as the Assistant Director for the Office of Program Consultation and Accreditation. Prior to coming on at APA, she was the director/coordinator of the school psychology program at Howard University, and is a clinical and school psychologist. She is the author of eight books, some of have been used to train psychologists in working with cross-cultural populations. Dr. Gopaul-McNicol has presented at various national and international conferences and has served as a psychological and educational consultant for various education departments around the world. Howard University, Washington D.C., U.S.A.
Queens College; City University of New York, U.S.A.